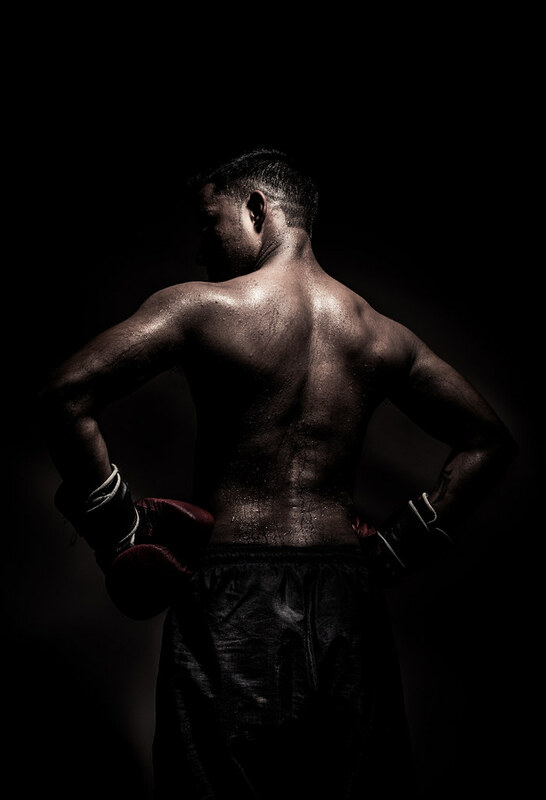 This post is about the "The Fighter Within" photo I had posted recently. It drew a lot of interest due to the high drama interms of lighting. The image is alsmost strait out of the camera with minor edits. The image was made with one light. There is a 20 degree grid which was at a 45 degree angle coming down from above. The distance was about 2 to 2.5 meters between the model and the light. The light was There is no fill and the and the subject was about half a meter from the wall in front. I was getting a good exposure at about f 11 from my light meter on the back of the athlete (which is the brightest part of the image) but the falling off light was too dramatic. I opened the aperture a bit and played around. This was a happy medium between blowing out the image and getting enough of the subject in light. A little bit of retouching in lightroom to bring out a bit of the hands and the track pants. Adding Matt Kloskowski Lightroom preset and wola the image is done.